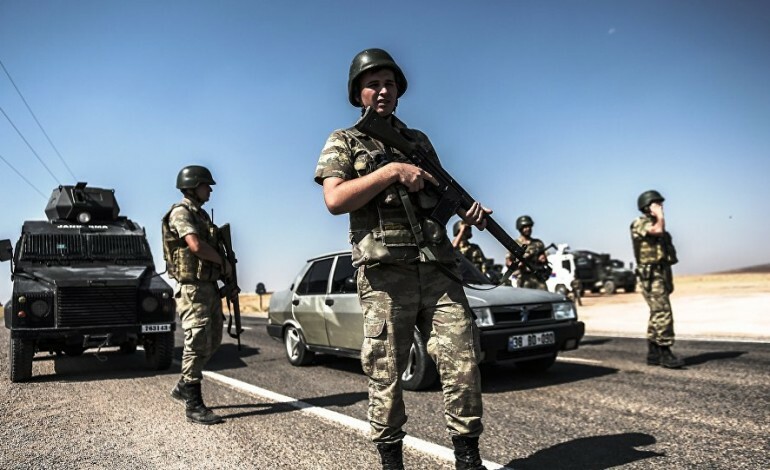 Turkish troops cross he Syrian border, in pursuit of Kurdish forces. Innumerable corpses of children are found lying unburied on the road. A Turkish major, who returned with me three days ago, said that many children were abandoned by their mothers on the way because they could not feed them anymore. Older children are taken away from their mothers by the Turks. The major, as well as each of his brothers, had an Armenian child with him; they intended to educate them as Mohammedans. One of the children speaks German. It must be one of the inmates of a German orphanage. It is thought that about 300 of the women who passed through here were confined on the way. In this place a family, in its dire poverty and despair, sold a girl of the age of 18 years to a Turk for T£6. The husbands of most of the women had been called up for service in the Army. Anyone who does not obey the summons calling him up is hanged or shot; there were seven cases lately at Marash. The conscripts are, however, generally used merely for mending the roads, and are not allowed to carry arms. Those who return home find their houses empty. Two days ago I met an Armenian soldier at Jarabulus, who had come from Jerusalem, having obtained leave to visit his native village, Geben (situated between Zeitoun and Sis). I have known this man for years. Here he heard that his mother, his wife and three children had been deported into the desert. All inquiries as to the fate of his family were fruitless. Corpses drifting down the Euphrates have been observed every day during the last 28 days, pairs of them being tied together back to back, while others are tied three to eight together by the arms. Anyone who wishes to remain alive is compelled to go over to Islam. In order to promote this, isolated families are in certain cases sent to purely Mohammedan villages. The number of deported persons who have passed through here and at Aintab has so far reached about 50,000. Nine-tenths of them were told on the evening before their deportation that they had to start in the morning. The majority of the convoys go through Ourfa, the minority through Aleppo. The first mentioned take the road for Mosul, the others for Der-ez-Zor. The authorities say that they are to be settled there, but those who escape the knife will certainly perish of hunger. Some 10,000 persons have reached Der-ez-Zor on the Euphrates; no news has so far been received of the others. As regards those who were sent towards Mosul, it is said that they are to be settled at a distance of about 16 miles from the railway; this probably means that they are to be driven into the desert, where their extirpation can proceed without witnesses. What I have written down is only a small fraction of all the cruelties which have been practised here during the last two months, and which assume larger proportions every day. It is only a fraction of the things which I have seen with my own eyes and heard from acquaintances and friends who were eye-witnesses. I am prepared at any time to mention the dates of the events and to give the names of the witnesses. Adapted from the anthology Germany, Turkey and Armenia (1917). Photograph courtesy of Western Armenia TV. Published under a Creative Commons license.